Materials: styrofoam, Japanese fabric, school glue. Tools: box knife, sculpting tools, sand paper. Technique: By tucking the edge of fabric into the carved grooves with the aid of glue, the fabric can be held in place. I learned this technique while attending a workshop held by a Japanese company that manufactures traditional Japanese dolls. Material-wise, I used styrofoam as a substitute of the cork-like material provided by the workshop. 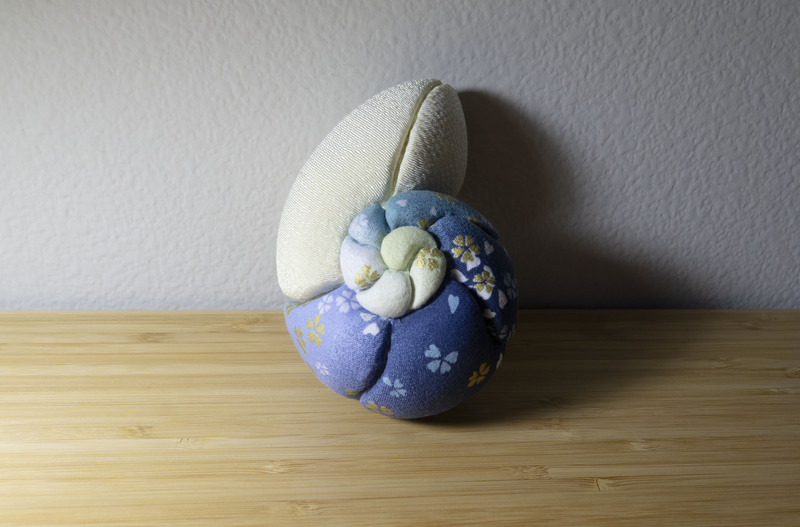 Concept: The faceted, curved surface of the dolls I saw in Japan reminds me of the form of shells. Shells and dolls also share similar qualities since they are both empty, delicate, and beautiful. Moreover, both are inanimate objects interestingly related to the concept of life. Shells are the remains of fleshy creatures with life once granted by nature, whereas dolls were infused with spirit, or the illusion of life because of humans’ emotions. Shells and dolls do not die, but they are the evidence of life or spirit that once existed in the world. Additional Research: The technique is called kimekomi (木目込み), which literally means sticking into the eye of the wood. Here is a link to a video about the constructing process of kimekomi ningyo (木目込み人形), or kimekomi dolls. This is also the same company that held the workshop.